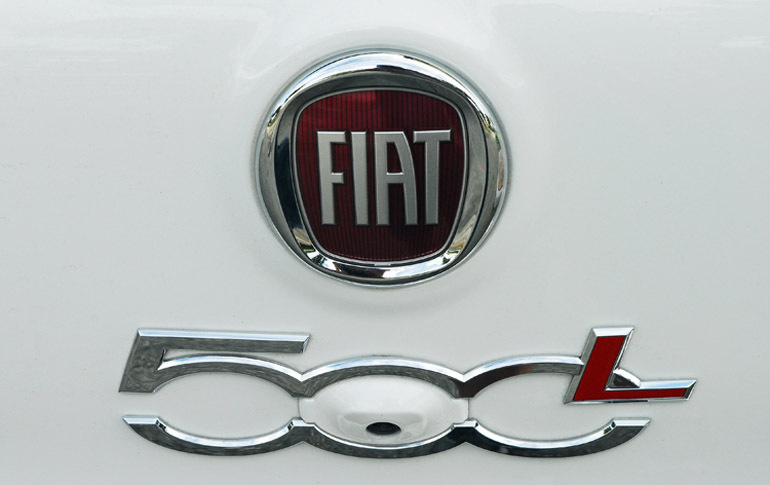 After a successful 2013 launch with the FIAT 500 two-door coupe, the all-new 2014 FIAT 500 expands the brand with new style, efficiency and driving fun. 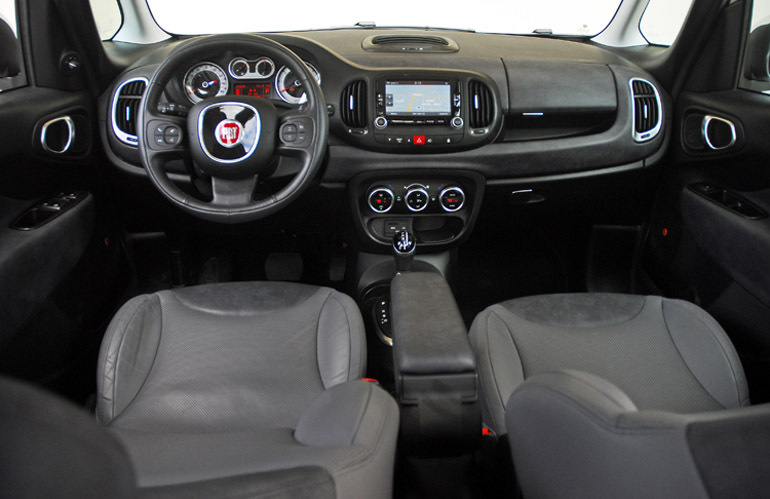 It offers up to 42% more interior space with comfortable seating for five, a fun-to-drive attitude with a standard 160hp 1.4 liter MultiAir Turbo engine taken from the Abarth, and mated with two fuel-saving, six-speed transmissions. The all-new FIAT 500L is for consumers who like the contemporary Italian style of the FIAT 500 but need more space and functionality to match their lifestyle needs. The unique 500L offers best-in-class interior space, class-leading horsepower, exclusive technology features all with the style that only Italians can craft. There are four 500L models to choose from: the base ‘Pop’, the up-level ‘Easy’, the rugged styled ‘Trekking’ and the top-of-the-line ‘Lounge’ model that I tested. All models are powered by the 1.4 liter, SOHC, 16-valve, water-cooled turbo-charged MultiAir inline 4-cylinder engine that generates 160hp at 5,000rpm and an excellent 184lb.ft. of torque from just 2,500-to-4,000rpm. My Lounge model came with the smooth shifting six-speed twin-clutch FWD sequential transmission that is fun and easy to use when I want to manual change gears and increase my acceleration. In fact I reached 60mph from a standstill in just 6.8sec., not bad for a 3,200 pound sedan. The unique exterior design is pure Italian heritage from FIAT with it new ‘small-wide’ architecture that includes some of the most radical and profoundly innovative design through a traceable sequence of previous models. Short front and rear overhangs give the car a more squat appearance. 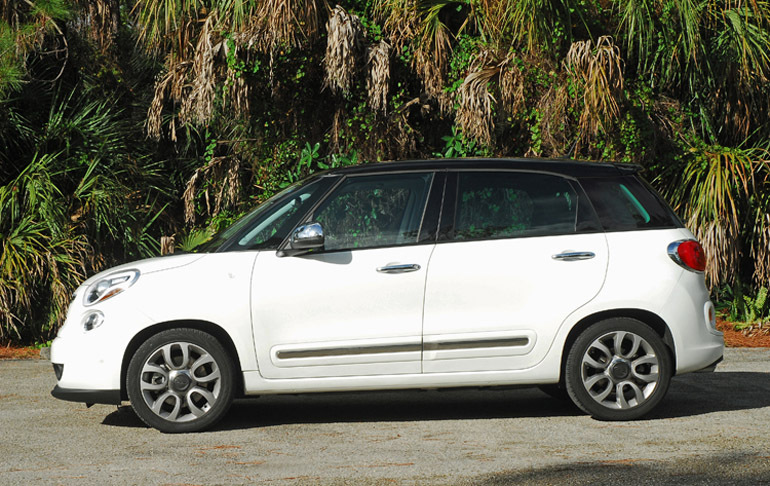 With its signature ‘whiskers and logo’ face-plus an additional 6.1 inches in width, the all-new 500L has even more presence while excluding the FIAT family resemblance in stylistic harmony. Larger bi-halogen projector headlamps and lower park lamps tie in the iconic look while the Lounge model comes with foglamps. 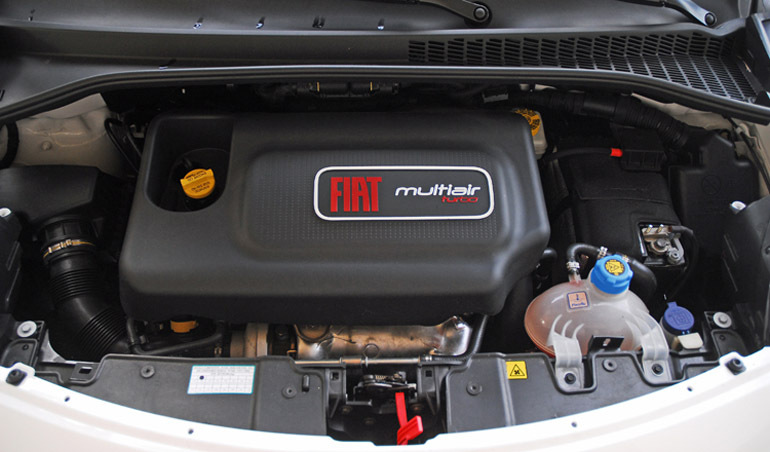 The front fascia, body-color fascia insert, cooling duct, lower honeycomb grille for the turbo, and the lower splitter continue the FIAT brand’s facial feature resemblance. The front also features a flat under-tray for better front-to-rear airflow. The new 500L also features segment-exclusive glass from the A-and D-pillars for an interior environment nearly encapsulated by 360-degree views for excellent front visibility. 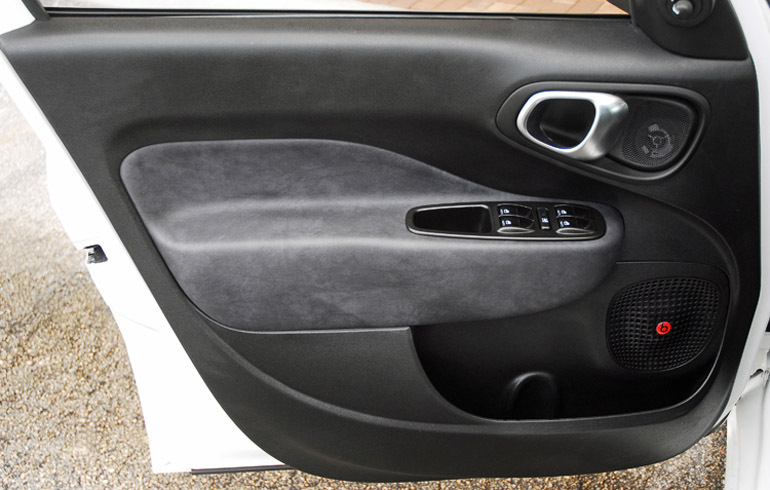 For an even more sporty appearance, the belt-and-window-molding surrounds are trimmed in Nero (black). In addition to a monotone look, the new 500L offers even more style with its ‘floating’ roof painted in Nero (black). The Lounge model that I tested came with the 20.7 sq.ft. 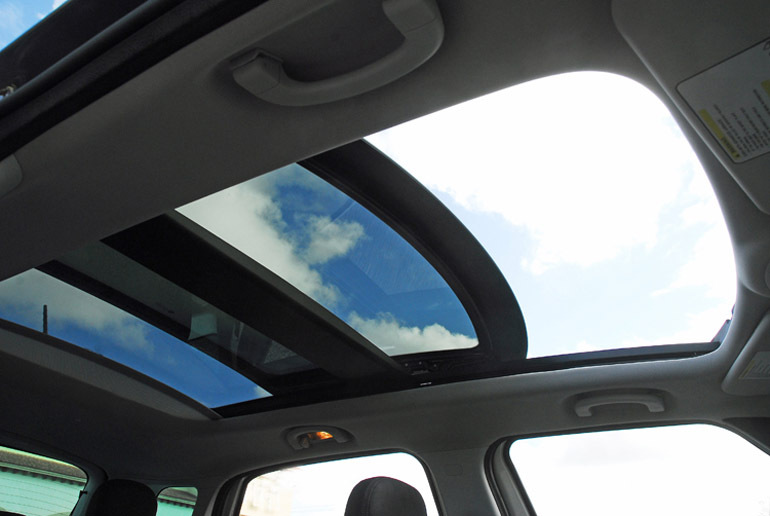 dual-pane glass system with a power sliding sunroof. The silhouette is 27.7 inches longer yet features the familiar forward-sloping A-line and adds a ‘cab-forward’ approach for improved visibility and an even more dynamic look. 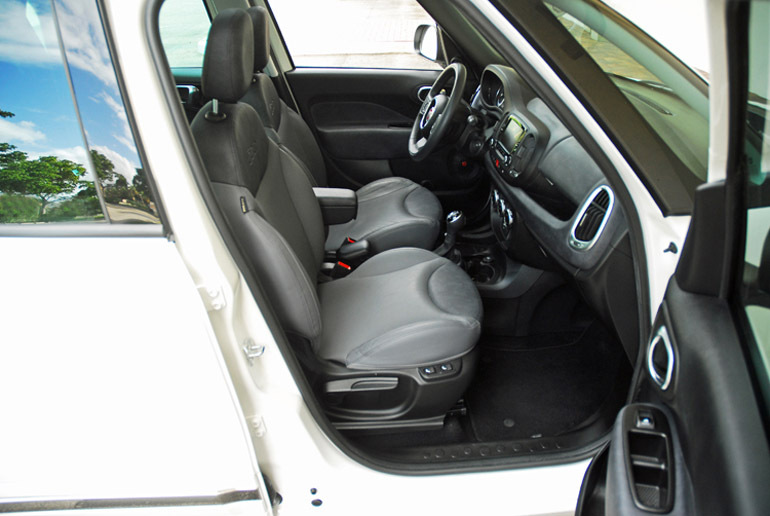 The 500L’s body-side lateral section features clean surfaces, flared wheel arches and chromed door handles. The Lounge model also came with chrome power-remote sideview mirrors and chrome strips at each lower door. The flared wheel arches are filled with unique 17X7 inch painted aluminum wheels wrapped with 225/45R17 inch performance tires. The rear fascia shows a top-mounted spoiler, wraparound LED tail and brake lights, large chrome 500L badge, a step-up bumper with a chrome inlay, a single polished stainless steel exhaust tip and a flat under-tray to help with rear airflow to enhance stability. The 500L’s rear liftgate is one of the segment’s lower cargo-lift heights at 26.2 inches for easier loading and unloading. All front and rear lamps are wrapped with chrome bezels for an even more luxury look. 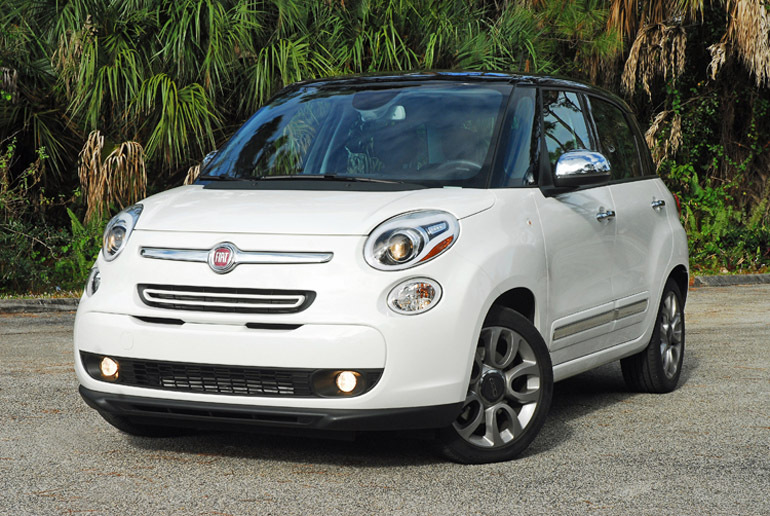 The all-new 2014 FIAT 500L is uniquely styled like no other four-door hatchback on American roads. Like a loft that provides a contemporary, wide, open and luminous dimension, the interior of the 500L offers in-class interior volume, thanks to 42% more interior space than the 500 hatchback for added capability, plus even more style and comfort for up to five passengers and their cargo. The interior feels larger than its exterior look with best-in-class front head and shoulder room, plus best-in-class rear cargo space (with back seats up). Also, with segment-exclusive glass A-to-D pillars for nearly 360-degree views, the 500L provides maximum outward visibility plus with an elevated second-row bench seat and the optional dual-glass panel electric sunroof, even those passengers seated in the rear get to enjoy the surrounding going by even more. The leather/heated/power-lumbar/height-adjustable manual control front bucket seats are comfortable and very supportive with manual bottom and back levers. The instrument panel is uniquely Italian styled with numerous personalization options. The upper instrument panel is designed to convey a sense of refinement, elegance and is wrapped with thick, soft-to-the-touch vinyl. The beefy, leather-wrapped steering wheel features manual tilt/telescopic for the perfect reach and rake plus redundant buttons for the Bluetooth hands-free phone, audio system and cruise control. 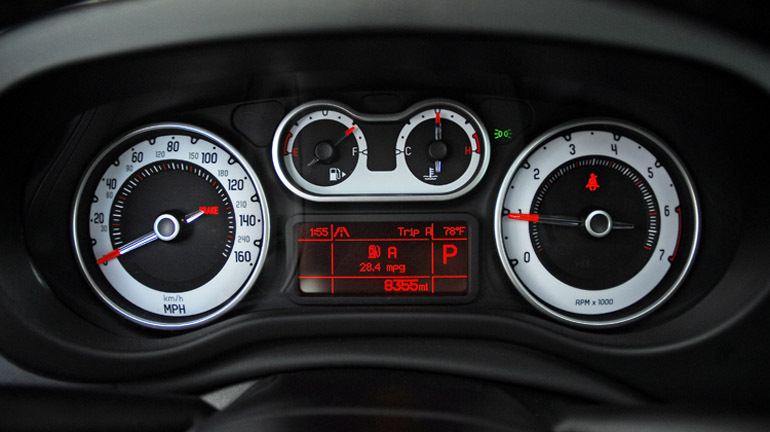 The instrument cluster features two easy-to-see while faced analog gauges for the speedometer and tachometer with two secondary gauges for fuel and engine temperature. The instrument cluster also includes an Electronic Vehicle Information Center (EVIC) that provides me with trip, vehicle and Uconnect system information. At the center the 500L is available with the all-new Uconnect 5.0 or 6.5 radio system that provides passengers with information and connectivity options on a 5-inch or larger 6.5 inch touchscreen. 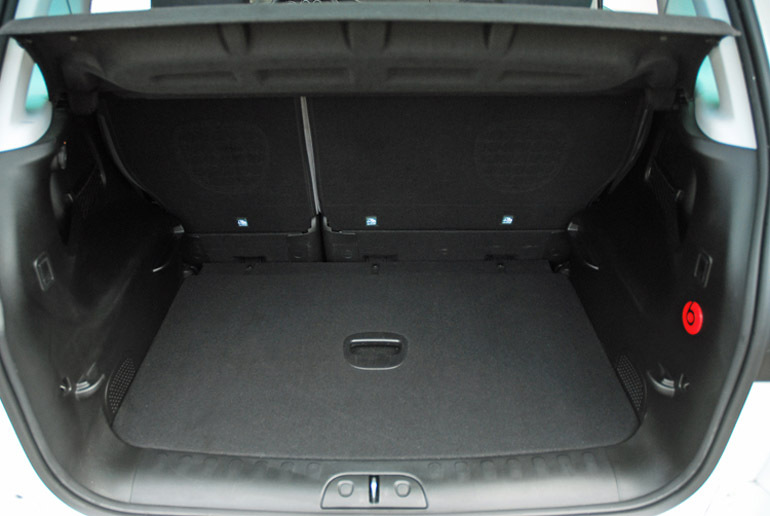 On the passenger side, a recessed instrument panel cubby and covered glovebox provide quick storage access. Designed to be ergonomic, the 500L’s climate controls are aluminum ringed with knurling for a better grip. The shifter is leather wrapped. The lower center console is also highlighted with space utilization with dual cupholders, plus large and small storage spaces to keep mobile devices at a convenient reach. All other buttons, dials and levers are within each reach and full illuminated for safe nighttime driving. 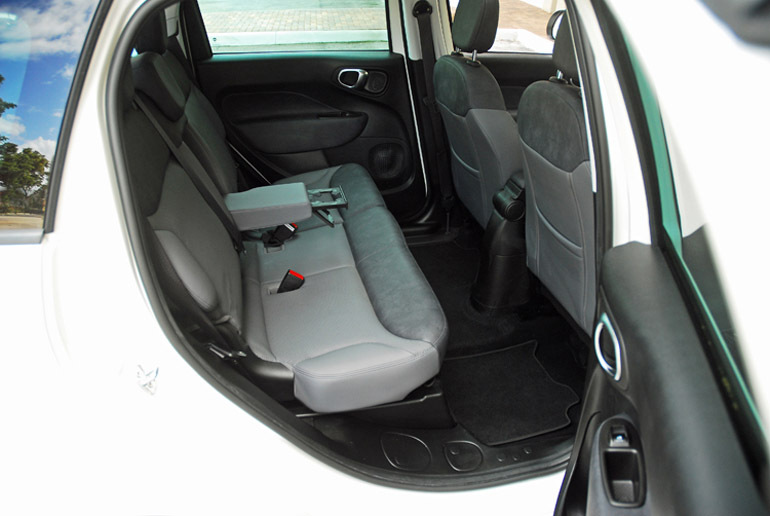 Each door features storage slots and the rear 60/40-split folding seat features a pull-down armrest and cupholder. Two reading lights in the rear also so the attention to detail inside. Standard equipment inside not mentioned above includes power express windows front/rear, power door locks, four grab handles, remote keyless entry, Hill Start Assist, security alarm, rear window defogger, variable intermittent wipers/washers, rear wiper/washer, 12-volt auxiliary power outlet up front and in the cargo hold, Sirius Satellite Radio, 6-premium speakers, dual-zone climate control, dual/lighted vanity mirrors, auto-dimming rearview mirror, front/rear floor mats and dual map lights. My lounge optioned model came equipped with the Beats Audio System with six-speakers and subwoofer, 225/45R17 inch Continental ProContac tires/17X7 inch painted aluminum wheels. The Premier Package also came with my test 500L that includes Uconnect 6.5 touch screen radio with GPS navigation, RearView Back-up camera and ParkSense Rear Park Assist. The Lounge model interior is elegant, sophisticated and contemporary as any four-door liftback compact sedan. 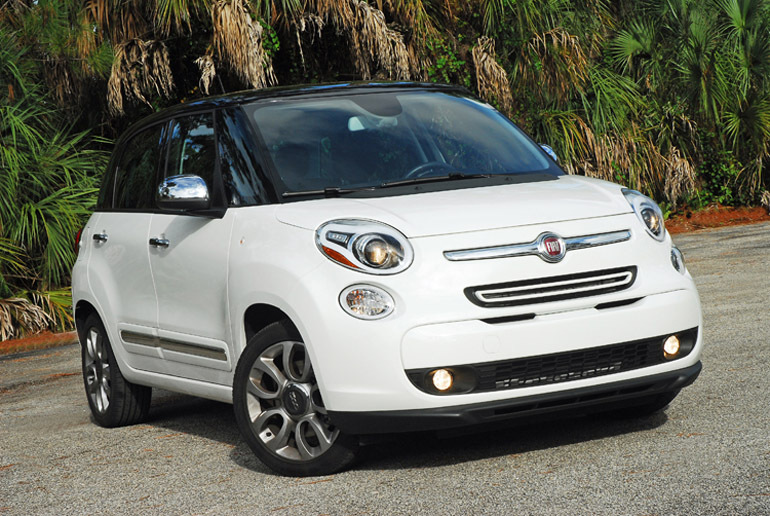 The all-new 500L is also fun and exciting to drive with its powerful 184lb.ft. of torque, twin-clutch, sequential shifting 6-speed transmission, power rack & pinion electric steering system with a great feel for the road and boosted just right. The independent MacPherson strut front suspension is a proven setup with coil springs, and twin-tube gas-charged shocks and stabilizer bar. The rear twist-beam axle setup also has coil springs and twin-tube gas-charged shocks and tracks very well when entering steep curving roads and maintain a stable ride at speed. The brakes work fine and are very linear when I pushed my foot on the pedal. Up front are 12-inch vented discs clamped with large single-piston calipers and 10.4-inch solid discs clamped with single-piston calipers in the rear. My control was always straight-ahead utilizing the standard ABS and electronic stability control. Driving the new 500L was fun and easy with plenty of acceleration and control at slow or fast highway speeds. Standard safety systems include advanced multi-stage front airbags, supplemental front seat-mounted side airbags, supplemental side-curtain front airbags, driver-inflatable knee-bolster airbag, reactive head restraints, child-seat anchor LATCH ready, 5-3-point airbags with front pretensioners/load limiters, front/rear crumple zones and steel beams in each door. 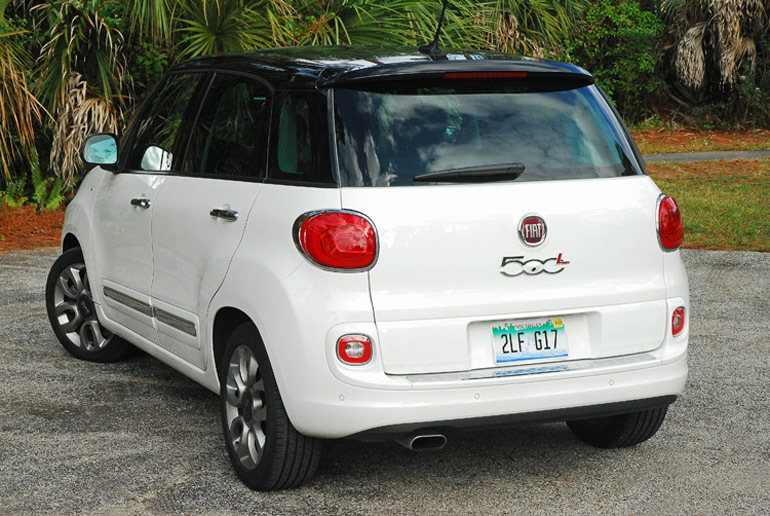 The all-new 2014 FIAT 500L is a new and exciting addition to the FIAT lineup and for the compact four-door liftgate segment of the industry. It features unique Italian good looks, a fun-to-drive attitude, and roomy, comfortable, ergonomic interior with the latest in connectivity and audio systems.